We are proud to announce that we have achieved SAP PartnerEdge Gold Partner status. At SAP, the world’s leading provider of business software, channel partners reach Gold Partner status for their business performance transactions, qualified solution offerings and for their capability-building and marketing activities. Business performance and transactional activities include selling licenses for SAP solutions to existing and new customers and creating new qualified solutions built on SAP. Capability-building activities include training / certification of partner resources, customer success stories and references, and executing successful marketing campaigns. PartnerEdge Gold status, the highest SAP channel partnership level, is achieved only by the best partners. It is a pleasure to announce that SHMA has qualified for yet another competency and is now a member of the Microsoft Dynamics partner community. Enjoying a Gold Partner status, which is the highest available; SHMA resources are working actively on a variety of Microsoft tools and technologies. Sidat Hyder Morshed Associates (Pvt) Ltd is a leading Independent System Vendor (ISV) in the country and with this new addition of Dynamics, we eagerly look forward to integrating this solution set with our existing ERP applications and offer better value to our customers. We also take this opportunity to announce the Beta release of our Investor services Solutions (Capella) for our Mutual Funds customers. The solution works in integration with Dynamics CRM 4.0 and is envisaged to add great value in managing and serving customers. KARACHI: The Aga Khan University Hospital’s (AKUH) state of the art, multidisciplinary service that is one of the the best in the region draws 600,000 outpatients annually from all over Pakistan and abroad. To improve its patient communication, reduce the communication cost and reduce the rate of missed appointments, AKUH has selected Mobiz messaging solution. Mobiz is being integrated to core HIS and other applications of AKU. Mobiz was selected because of its comprehensive features, functionality supported with a dedicated and proven delivery experience and economical pricing. This innovation is first of its kind in Pakistan whereas in UK, studies have showed 50% decline in Missed Appointment Rate. SHMA’s mobiz provides a one-stop and flexible messaging solution to add value, reduce cost and improve communication. The premium “Home Remittance Software Solution”, with comprehensive set of functions that fully support Pakistan Remittance Initiative (PRI). With this advancement, JS Bank aims to automate its entire home remittance operations including receiving of remittance from overseas remitting entities/exchange companies, fulfillment of AML requirements, compliance with SBP directions and instantaneous delivery to beneficiaries via various channels including payment over counter. RemitHome will also facilitate processing of commission claims and financial accounting. Sidat Hyder RemitHome has received tremendous welcome since its launch last month and many financial institutions are considering to adopt it for their remittance business automation. Banking customers. Today that confidence is reinforced and taking rapid leaps, Soneri Bank has extended and commenced mobiz SMS services across all its product line in very short period, including Branch Banking, Internet Banking, Online Banking and Card Based Transactions. Keeping in line with emerging demands, Soneri Bank is also gearing up for Mobile Banking and International Client facilitation. KARACHI: Faysal Asset Management Ltd is a leading asset management company with the support and collective wisdom of large international financial institutions like Islamic Investment Company of the Gulf and Faysal Bank Ltd. Awarded as “Fund Manager for the Year- 2008”, FAML has recently signed up with SHMA to replace its existing software with SHMA solutions for Mutual Funds. SHMA solution for Mutual Funds offers a comprehensive integrated suite for Investment Management (iPaMs), a feature filled Investor Services application suite and a very comprehensive and proven Sidat Hyder – ERP-for-ALL (Financials) application suite. DUBAI: Headquartered in Dubai, U.A.E., Mammut was established in 1995, and today is recognized as the largest Industrial Contracting Company and manufacturer of Trailers in the Middle East. The Group’s activities include the manufacturing of specialized trailers for the transportation industry, pre-engineered steel buildings, pre-cast concrete manufacturing, and infrastructure development. Mammut has engaged SHMA’s Oracle Technology Group to provide support in development of Oracle Apps reports and interfaces, Process optimization and development of custom interfaces. A four man team was deployed in Dubai to undertake and deliver the assignment as per requirements and customer needs. Our Oracle Technology Group offers a diverse range of Managed Services related to Oracle Apps, DB Administration, Offshore and Onshore programming & Support, Identity Management, Oracle BI and much more. RAK Ghani is a UAE-based company, sponsored by Ghani Glass Group, RAKIA (investment wing of the Government of Ras Al Khaimah), JS Group and SJC – RAK Ghani. Ghani Glass has been a market leader in the pharmaceutical glass packaging for more than fifteen years now. The company boasts a packaging plant of a ‘state-of-the-art’ technology with technical expertise from the Ghani Group. We are proud to inform that recently RAK Ghani Glass has signed up for Sidat Hyder Applications Suite as its choice of ERP. With numerous successful live software implementations in the country and across the globe, SHMA has always maintained keen focus on quality assurance and testing of its product suite and industry vertical solutions. The company maintains dedicated software quality assurance and testing teams. As a Microsoft Gold Partner, SHMA has invested and is developing extensive knowledge and capabilities in providing automation and implementation of Microsoft Unified Communications and its allied products including, Microsoft Office Communications Server, Microsoft Office Communicator, Microsoft Office Live Meeting Service and Microsoft Office Outlook. Microsoft Unified Communications streamlines communication and collaboration that allows people to contact each other at the right time, on the right device, with one-click convenience and real-time presence. Unified Communications technologies use the power of software to deliver complete communications (messaging, voice and video) across the applications and devices that people use every day. SHMA services with UC technologies will help businesses not only streamline their commercial communications, but will also help build in the required protection and a future-ready foundation for that communication. This would increase efficiency and reduce costs, while managing flows without the countless dependencies on different devices and media. Habib Qatar International Exchange Pakistan (Pvt.) Ltd., an emerging exchange company and the fastest growing agent network of Western Union has selected mobiz SMS Solution to enhance its business communication and brand image. They are planning to use it for improving customer satisfaction, customer loyalty and brand identity. Mobile Phone penetration in Pakistan is much higher than conventional media and SMS rides on this mobile wave by providing an effective and simple way of communicating timely information to the customer. mobiz SMS solution is a flexible solution that makes it easy for corporate IT teams to manage SMS communication from their existing software in a flexible way. Sidat Hyder Morshed Associates has once again launched its Human Resource Benchmarking Survey (HRBS 2008) to gain insight into the prevailing HR trends which are being followed by organizations in Pakistan. The survey also identifies best in class human resource policies and practices, which, when implemented, can help your company achieve exceptional performance. The first HRBS was launched in 2006 with the intention of capturing the overall picture of what we, as HR practitioners in Pakistan, are actually doing and how we can leverage our collective experience to maximize gains for your organization. 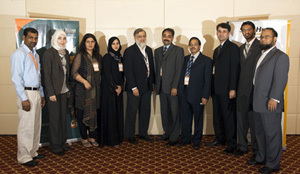 The results of HRBS 2006 threw light on the evolving new proactive, centralized and participative trends in HR in Pakistan. A survey report will be prepared for participating organizations, and a Seminar is also planned for August 6, 2008 where key findings of the survey will be highlighted. We are also encouraging organizations to share their HR related success stories which may also be highlighted in the survey report. Colgate-Palmolive and Sidat Hyder Morshed Associates (Pvt) Ltd has signed an agreement by which Colgate-Palmolive (Pakistan) Limited, Tetley Clover (Pakistan) Limited and Clover (Pakistan) Limited will use Sidat Hyder – Sales and Distribution for automating its distribution and sales force activities. Afghan United Bank, a newly established commercial bank in Afghanistan, has signed up with Sidat Hyder Morshed Associates for the implementation of one of its banking products “Sidat Hyder - Web-Based Core Banking solution”. Afghan United Bank is seeking to automate its entire commercial banking operations including retail banking, delivery channels, payments, consumer finance, corporate finance, trade finance and treasury. Lebanon: Al-Mashrek Insurance and Reinsurance to implement iLaS. Al Mashrek Insurance & Reinsurance (Lebanon) and Sidat Hyder Morshed Associates (Pvt) Ltd has signed an agreement by which Al Mashrek will use Sidat Hyder – Individual Life Administration System for automating its life insurance and sales force activities. Peoples Steel Mills Limited (PSM) is the only facility of its kind in Pakistan engaged in the development and production of alloys and special steels using modern techniques to produce high quality alloys. Continuing in the same spirit – “to improve business process efficiencies in order to effectively compete in the marketplace” - PSM has also decided to arm itself with an efficient information system to be able to make informed decisions at the right time. In this regard, PSM has opted to implement Oracle E-Business Suite of applications. PSM has engaged Sidat Hyder Morshed Associates for implementation and support services, considering SHMA’s experience and count of successful implementations. SHMA’s consultants will be implementing Oracle modules that include: Financials, Human Capital Management (including Payroll), Supply Chain Management (Purchasing, Inventory, Order Management, Process Manufacturing and Discrete Manufacturing) and Enterprise Asset Management. SHMA celebrated the completion of a year of successful operations of its Dubai office at JW Marriott in December 2007. The event was attended by members of different companies and operational divisions wishing SHMA a promising future in Dubai and the GCC region. Members of BRAMER Asset Management, Emirates, Noor Group and Yahoo were a few who were present at the event. Sayyed Engineers is a pioneering ballpoint pen manufacturing company in South Asia. The company has recently signed-up for Sidat Hyder – Financials to fulfill its accounting needs. In addition to the head office in Lahore, there are five branch offices at Rawalpindi, Peshawar, Multan, Faisalabad and Karachi, and an overseas office in the UAE. The company has established state-of-the-art facilities for the manufacturing of ballpoint pens and lead pencils. From the time of its inception in 1967, Sayyed has continued its commitment to quality and innovation. In addition to being the largest producer of ballpoint pens in Pakistan, it has also been exporting its quality products to many other countries, including Holland, Turkey, Cyprus, Iraq, Iran, Syria, Egypt, Lebanon, Kuwait, Russia, Afghanistan, Algeria, Libya, Madagascar, Jordan, UAE and Saudi Arabia. Established in 1952, Oriental Press is one of the leading printing press companies in the Middle East. From a humble beginning in Bahrain, the company has set itself on a growth path. Oriental Press’s management aims to stay ahead in providing better quality of print products, service and satisfaction with increasing investments in technology, equipment and human resource and growing commitment to quality. Today, the company offers services to a large client base in other parts of the Gulf and Middle East, and has spread its wings to Europe as well. To support business expansion plans and achieve growth targets, Oriental Press’s management realizes the need for streamlining current processes, people, procedures and structures by adopting industry best business practices with a move towards an SBU (strategic business unit) based structure. Considering SHMA’s experience & success in a number of BPR and Change Management assignments for client organizations in the Middle East & South Asian region, Oriental Press engaged SHMA to guide them in business process reengineering and managing the resultant change. Based on the outputs of SHMA ’s efforts, the company will contribute to implementing an ERP solution. Pak-Arab Refinery Limited, commonly known as PARCO, is a fully integrated energy company. It is a leading player in Pakistan’s energy industry with an asset base of about 100 billion. As a joint venture between the Governments of Pakistan and Abu Dhabi, it is seen as a role model of Pak-Arab business cooperation and an 'enlightened investment decision'. PARCO is poised to consolidate its growth and strategic supplier role in Pakistan. To support its growth initiatives, besides other things, PARCO has embarked on a plan to streamline its business processes and to implement new systems to support them. In this regard, PARCO has engaged Sidat Hyder Morshed Associates as their information technology consultants with the assigned role of managing and supervising their SAP implementation with a view to automate all aspects of their business. According to PARCO’s management, considering the fact that SHMA has extensive experience of having provided similar support to a number of companies, and its reputation for delivering quality results and ensuring project success, its appointment for the project is a fairly sound and logical decision. SHMA’s competitive advantage is a combination of sound in-depth business knowledge and ERP skills, which we offer to clients across many industry verticals. In the recent years, companies in Pakistan’s energy sector that have availed and benefited from SHMA services include Pakistan Petroleum Limited, Pakistan State Oil, National Refinery Limited, Sui Southern Gas Company, Attock Refinery Limited, to name a few. Copyright © 2009 - 2010 SHMA Worldwide - All Rights Reserved.